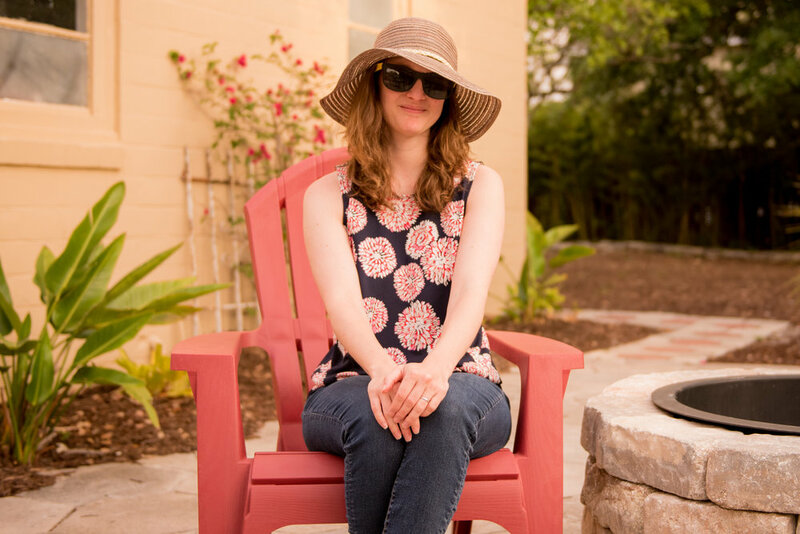 While I would love to be able to tell you about how we finished painting, stenciling, and installing our chair rail (and maybe even board and batten) in our bathroom, I can't just yet. 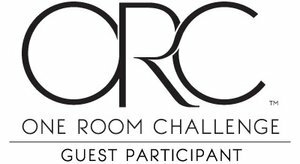 It's Week 4 of the One Room Challenge™—with many thanks to Linda for organizing and hosting this great design community, and thanks to media partner House Beautiful. I've heard that this week tends to be the most challenging one of the challenge, and I sure hope so! I started back at work last week following my maternity leave, still sick after having pushed back my start day to recover. Even though it was a short week with a Monday holiday and my new schedule with Fridays off, it was still a difficult few days, and this week is starting similarly. Between being sick and having a baby who's not taking a bottle, then nursing constantly as soon as I get home, I've unfortunately fallen behind on the DIY portion of our tiny 3/4 bathroom renovation. I have been getting to bed at 8 or 9 PM each night, though, which must be good for me, right? This was my test of the stencil in light colors on a dark background; in the bathroom, walls will be off-white and stencil will be light gray with darker gray birds. We've made some more painting progress: we've got two coats of paint on the upper and lower portions of the walls, so they're ready for stenciling, which I hope to do this weekend. I did test the stencil (Birds and Berries from Cutting Edge Stencils, which is generously supporting this part of my project) in the back of the new closet we've had framed into the adjoining office, and am pretty pleased with how it turned out. It's my first time trying a stencil, so I was nervous, but now I feel ready to try it out on my bathroom walls. I'm not as sure about my paint choices: I went with a satin finish in Benjamin Moore's kitchen & bath paint for the upper walls (White Dove) and a semi-gloss for the lower walls and future chair rail/board and batten (Silver Chain), but, as the giant crab Tamatoa would say, "I can't—I'm too shiny!" I really wanted a finish that would stand up to abuse from preschoolers, but perhaps satin would have been enough since it's that special kind of paint. I may re-paint the lower portion after I've seen how it looks with the chair rail. Hopefully not. Walls await the chair rail...I marked a thin line with a long ruler and a level all around the bathroom where the middle of the chair rail should go, then painted roughly to that line, starting with the upper walls. The chair rail should cover the uneven edges. You can see a peek of the tile floors that our contractor installed this past week. I still haven't looked closely since we've had it covered up, but I like what I've seen! Unfortunately, the company that was supposed to replace the toilet that arrived broken has canceled our replacement order since the product is now out of stock. We may have to go with something entirely different. It's important to me to get one that's as water-efficient as possible, and I'm not crazy about the dual-flush models, but we may need to go that route. Recommendations, anyone? The window that arrived in the wrong finish also hasn't been replaced yet, and I'm not sure if it will be by the end of the challenge. In the meanwhile, at least we have a little extra light! No, we did not order a window in an almost-black finish...though it should be dark bronze on the exterior. It's supposed to be white inside. Aside from a new toilet, the other important remaining decision is a sink faucet: I love goosenecks but since the pedestal sink is so small, I don't want anything that will overwhelm it. It's also 4-inch centerset, and I'd prefer a mini-widespread over a deck-mounted faucet, but I haven't found a lot of options. 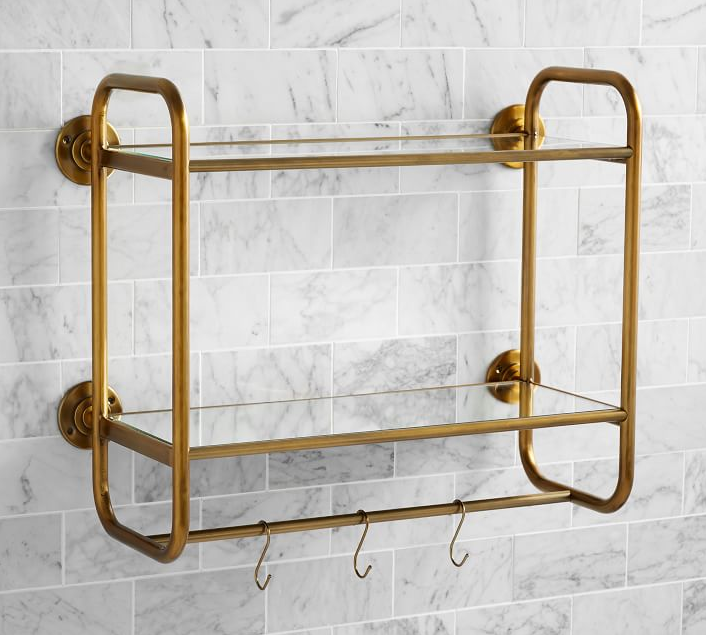 I'll most likely go with an oil-rubbed bronze finish to match the rest of the bathroom, but could do brass if I found the right tone to match the shelf. It's tricky since it's a vintage-style finish rather than modern brass. It's a good thing we have our upstairs bathroom while these renovations are occurring. I still haven't shared much of the rest of my house, but here's one corner of our main bathroom. Yes, it's an alcove tub/shower combination, but I love the glass doors and the subway tile, and it really suits our needs with young children to bathe, versus a deep standalone tub that's difficult to bend over. I'm happy with how this and the rest of our home renovations have looked, so I'm hopeful that our soon-to-be renovated first floor bathroom will be great for our family, too. Our first bathroom renovation project (floor tiles are the same as we're using downstairs; we had some leftovers from this project and were able to buy additional ones for our new project). Excuse the poorly lit photos in this post; I'll share better ones when the weather improves and we have more natural light!